Abstract: The surface deformation of the Tatra Mountains region in Western Carpathians can nowadays be studied directly thanks to precise geodetic measurements using the GNSS. The strain or stress tensor field is, however, a rather complex “data structure” difficult to present legibly and with sufficient resolution in the form of a classical map. A novel and promising approach to the solution of this problem is coding the three principal strain or stress values into the three colour channels (red, green, blue) of an RGB colour. In our previous study, the colour depended on the stress tensor shape descriptors. In the current study, the adapted colouring scheme uses a subset of shape descriptors common to stress and strain, which differ only in the scaling factor. In this manner, we generate the colour map of the surface strain rate field, where the colour of each grid point carries the information about the shape of the strain rate tensor at that point. The resulting strain rate colour map can be displayed simultaneously with the map of the faults or elevations and be easily checked for the data or interpolation method errors and incompatibility with the geophysical and geological expectations. Abstract: The Danube/Kisalföld Basin is the north-western sub-basin of the Pannonian Basin System. The lithostratigraphic subdivision of the several-km-thick Upper Miocene to Pliocene sedimentary succession related to Lake Pannon has been developed independently in Slovakia and Hungary. A study of the sedimentary formations across the entire basin led us to claim that these formations are identical or similar between the two basin parts to such an extent that their correlation is indeed a matter of nomenclature only. Nemčiňany corresponds to the Kálla Formation, representing locally derived coarse clastics along the basin margins (11–9.5 Ma). The deep lacustrine sediments are collectively designated the Ivanka Formation in Slovakia, while in Hungary they are subdivided into Szák (fine-grained transgressive deposits above basement highs, 10.5–8.9 Ma), Endrőd (deep lacustrine marls, 11.6–10 Ma), Szolnok (turbidites, 10.5–9.2 Ma) and Algyő Formations (fine-grained slope deposits, 10–9 Ma). The Beladice Formation represents shallow lacustrine deltaic deposits, fully corresponding to Újfalu (10.5–8.7 Ma). The overlying fluvial deposits are the Volkovce and Zagyva Formations (10–6 Ma). The synoptic description and characterization of these sediments offer a basin-wide insight into the development of the basin during the Late Miocene. The turbidite systems, the slope, the overlying deltaic and fluvial systems are all genetically related and are coeval at any time slice after the regression of Lake Pannon initiated about 10 Ma ago. All these formations get younger towards the S, SE as the progradation of the shelf-slope went on. The basin got filled up to lake level by 8.7 Ma, since then fluvial deposition dominated. Abstract: This contribution focuses on the Perisphinctoidea ammonite taxa from the Upper Tithonian of Charens (Drôme, south-east France). Emphasis is laid on five genera that belong to the families Himalayitidae and Neocomitidae. We document the precise vertical range of the index-species Micracanthoceras microcanthum, and a comparative ontogenetic-biometric analysis sheds new light on its range of variation and dimorphism by comparison with the best-known Spanish populations. As herein understood, the lower boundary of the M. microcanthum Zone (base of the Upper Tithonian) is fixed at the FAD of its index species. The faunal assemblages and species distribution of the P. andreaei Zone is rather similar to those described at the key-section of Le Chouet as confirmed by the co-occurrence of the genera Protacanthodiscus, Boughdiriella and Pratumidiscus. New palaeontological evidence supports the view that the basal Neocomitidae Busnardoiceras busnardoi derives from Protacanthodiscus andreaei in the upper part of the P. andreaei Zone. Abstract: Stratigraphic subdivision of the Upper Miocene deposits in the Pannonian Basin has been traditionally based on the endemic mollusc species of Lake Pannon. The cockle species Lymnocardium soproniense Vitális, apparently evolving through a sympatric speciation event in the sublittoral zone of Lake Pannon about 10.2–10.3 Ma, attained wide geographical distribution in the Pannonian basin and thus may serve as a good stratigraphic marker. Lymnocardium soproniense was one of the few large-sized cockles in Lake Pannon, most closely related to its ancestor, L. schedelianum (Fuchs), and to another descendant of the latter, L. variocostatum Vitális. According to the δ18O stable isotope record of its shells, the large size of L. soproniense was coupled with an extended life time of more than 10 years, probably reflecting a stable lake environment with increased resource availability and decreased predation. The species lived in quiet offshore conditions, below the storm wave base, where clay was deposited from suspension and the influence of currents was negligible. The base of the Lymnocardium soproniense Zone in the sublittoral deposits of Lake Pannon is defined by the first occurrence of the species, whereas the top of the zone is marked with the base of the overlying Congeria praerhomboidea Zone, defined by the FAD of C. praerhomboidea. Abstract: A new Middle Miocene (Langhian – early Serravallian) assemblage with shark and ray teeth from Nyirád (Hungary, Transdanubia, Veszprém County) consists of nine families, with 15 different species. The assemblage shares many common genera with other Middle Miocene assemblages in the Paratethys (Notorynchus, Carcharias, Otodus, Cosmopolitodus, Hemipristis, Galeocerdo, Carcharhinus, and Aetobatus), and reflects a subtropical climate and a close connection with the Mediterranean Sea. However, a detailed faunal compilation of Miocene selachians reveals that several taxa that were still present in the Mediterranean or lived in the Paratethys during the Lower Miocene disappeared or became very rare by the Middle Miocene in the Central Paratethys (e.g., Isistius, Centrophorus, Mitsukurina, Carcharoides, Parotodus, Alopias). The taxa that went locally extinct in the Paratethys are mainly represented by deep-water or pelagic forms. Their disappearance is most probably related to the gradual separation of the Paratethys from the Mediterranean. The common presence of some large, rather pelagic sharks (e.g., Otodus, Cosmopolitodus) in the Central Paratethys during the Middle Miocene is explained here by the widespread occurrence of their potential prey represented by marine mammals (e.g., whales and dolphins). Abstract: The Dukla Nappe belongs to the Outer Western Carpathians, which suffered considerable shortening due to the convergence and collision of the European and African plates. In this paper we present new paleomagnetic and magnetic anisotropy results from the Polish part of the Dukla Nappe, based on 102 individually oriented cores from nine geographically distributed localities. Susceptibility measurements and mineralogy investigations showed that paramagnetic minerals are important contributors to susceptibility anisotropy (AMS). The AMS fabrics are related to deposition/compression (foliation) and weak tectonic deformation (lineation). The AARM fabric, that of the ferrimagnetic minerals, seems to be a less sensitive indicator of tectonic deformation than the AMS fabric. The inclination-only test points to the pre-folding age of the remanent magnetizations. Seven localities exhibit CCW rotation, a single one shows CW rotation. The CCW rotated paleomagnetic directions form two groups, one showing large, the other moderate CCW rotation. Previously published paleomagentic directions from the Slovak part of the same nappe exhibit smeared distribution between them. 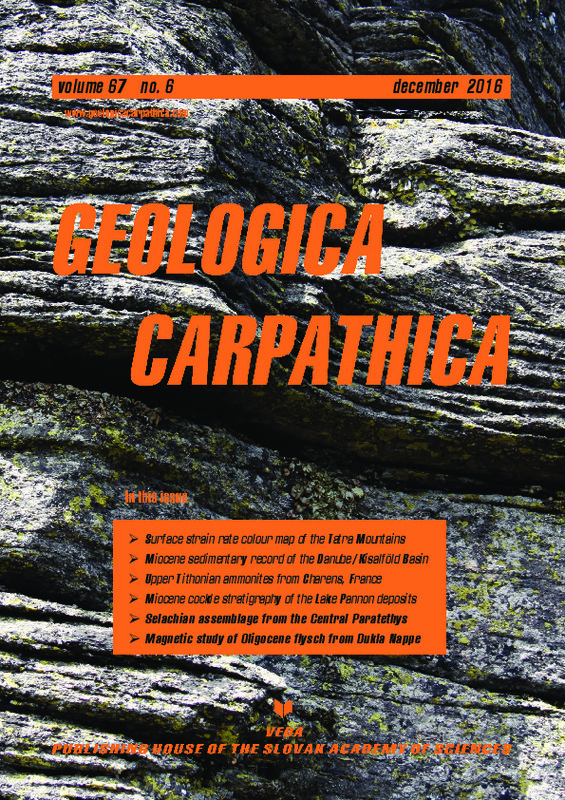 The declination of the overall-mean paleomagnetic direction for the Dukla nappe is similar to those observed in the neighbouring Magura and Silesian nappes, but it is of poorer quality. The AMS lineations at several localities are deviating more to the west from the present north than that of the local tectonic strikes. A possible explanation for this is that the AMS lineations were imprinted first, probably still in the Oligocene, while the sediments were soft (ductile deformation) and the folding and tilting took place during the CCW rotation.